See? It says "1890" right there! Impressive research, well worth $13,000, I say. I've chosen a townhouse because, remember, architectural style does not respect class, only purpose. But what's the thing at the back of the building? And how do you know that that wasn't part of the original building? at a time when almost the entire block had been developed. Recall that the city in the 1880's saw a huge increase in immigrant labor spurring a development craze of Old Law 6-story tenements built deep into the lot. 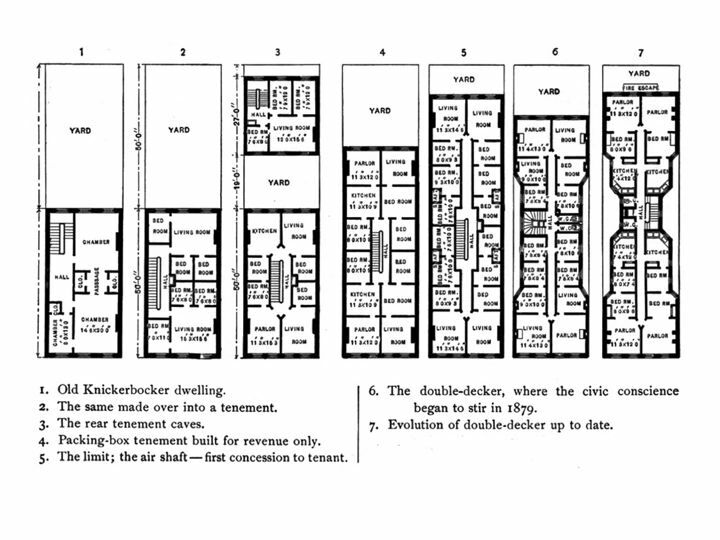 By 1897 most of the buildings on this street had been redeveloped into Old Law Tenements, and by 1911 -- ten years past the New Law -- all of them had been with the exception of 165 and the corner lot which, because it could be built over the entire lot and not need a large courtyard carve out of it. You'll notice also that the Old Law tenements are built further out to the street, leaving 165 a little recessed. 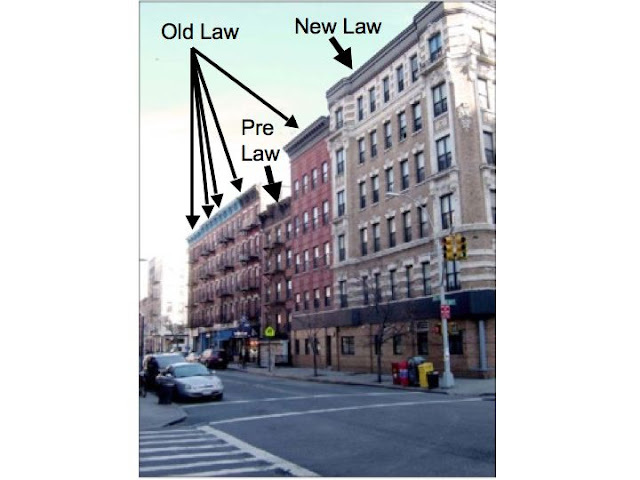 Deeply built Old Laws surrounding 165, and the New Law on the corner by 1911. In other words, this block was being redeveloped in the tenement boom of the 1880's-90's. 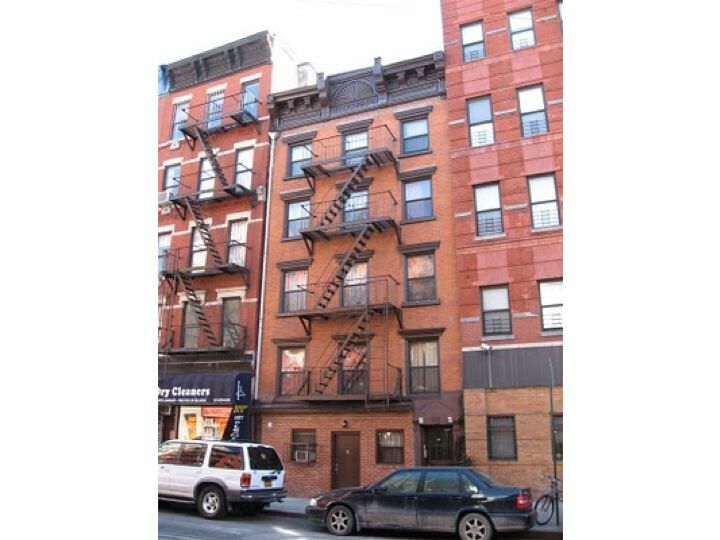 165 was the last remaining pre-law tenement on the block, when in 1901 the New Law cut off all redevelopment for midblock single lots. 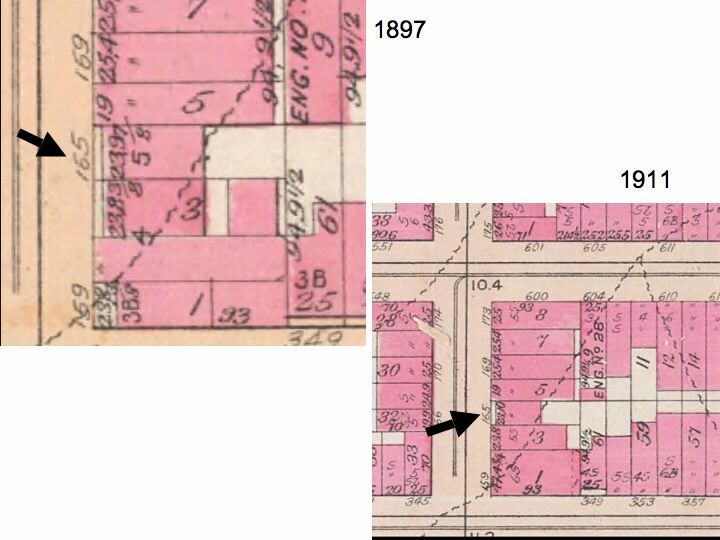 The corner lot went on to become a New Law Tenement, the landlord buying the lot next door to maximize his rental space. 165 missed its chance for redevelopment. It's still here today. Preservation of small lots was one of the unintended consequences of the New Law. By 1916, the landlord made the best of a poor lot by extending the rear still complying with the New Law courtyard requirements. The coloring, which you can clearly see was done by hand, covers the recess. The recess is represented by the line where the width footage number lies. 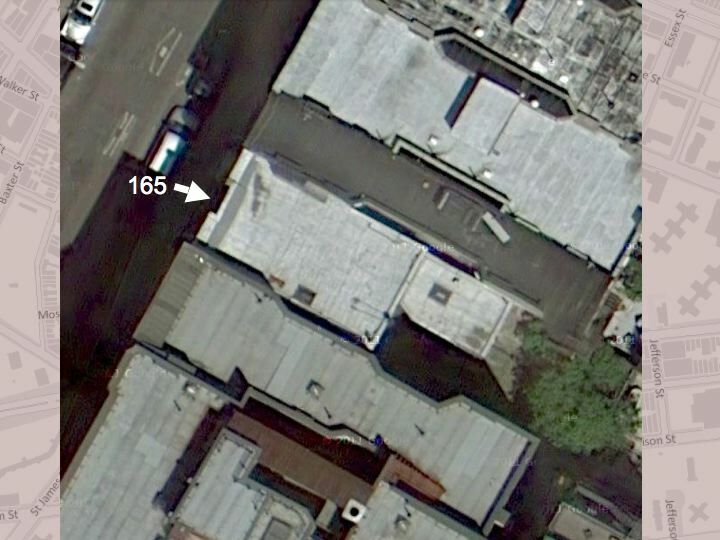 Now take another look at the googlemap overhead. Can you see the recess? If not, then look at the front again. The space that the drainpipe occupies is that little recess. But wait, wait, wait just a minute! The cornice says "1890," damnit. When I gave this talk at the Janina, this old guy -- must have been 90 if he was a day -- in the front with a big smile and a guffaw said, "The cornice is from 1890!" Jacob Riis, in his classic How the Other Half Lives, written in 1890 (!) mentions this towards the end of the book. The practical question is what to do with the tenement. 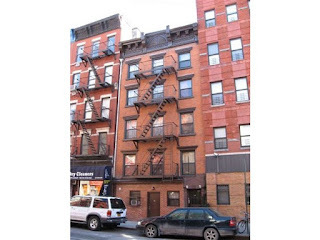 I watched a Mott Street landlord, the owner of a row of barracks that have made no end of trouble for the health authorities for twenty years, solve that question for himself the other day. His way was to give the wretched pile a coat of paint, and put a gorgeous tin cornice on with the year 1890 in letters a yard long....That was a landlord's way, and will not get us out of the mire. 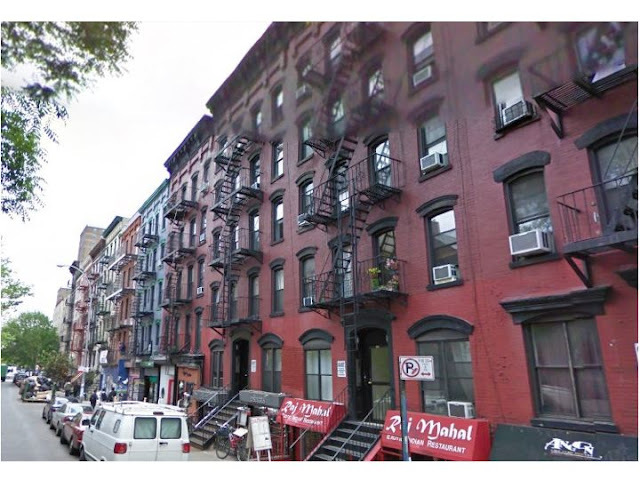 Replace "Mott Street" with "Avenue B" and you've got the story of 165. Most likely the landlord bought the building that year. His cornice may have persuaded prospective tenants that the building was new, or it may have been a convenient means, along with a small bribe, for the buildings inspector to overlook any violations and record the building as newly built and therefore compliant with the law -- the cornice covered him in case anyone asked. Apparently $13,000 is not enough to pay for a reading of a classic that is online for free. All the important preservation organizations, btw, signed on to this letter which then went to the city's Landmarks Preservation Commission. 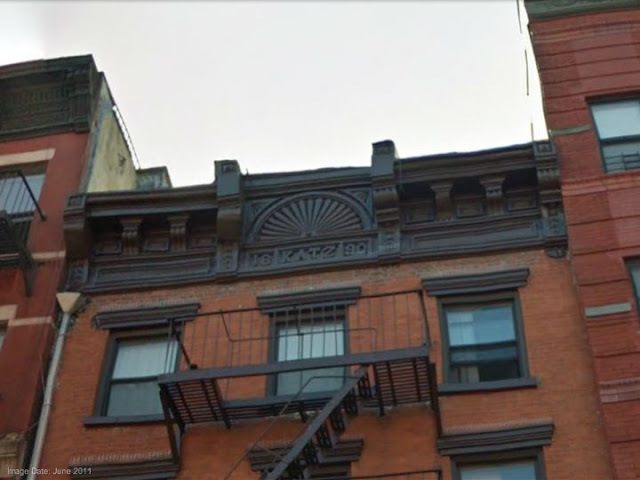 If they ever bother to investigate the building for landmark designation, I'm sure they'll be lenient with GVSHP -- after all, anyone can make a mistake. But what will they think about the rest of their claims? At least the mistake was in the right direction. 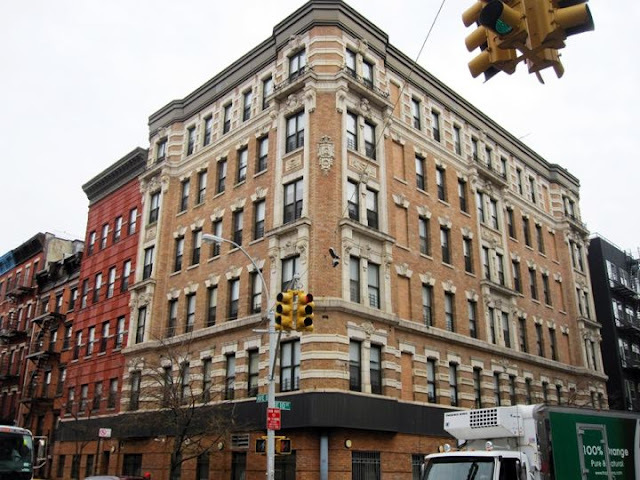 LPC will be pleasantly surprised that the "1890 Katz" building, although neither 1890 nor built by Katz, is in fact one of the oldest tenements in the neighborhood. 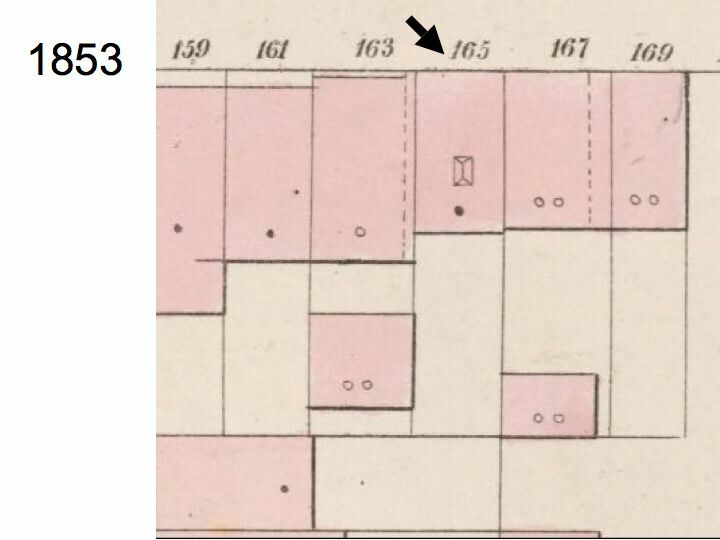 This kind of mistake is all too common in the understanding of tenements. 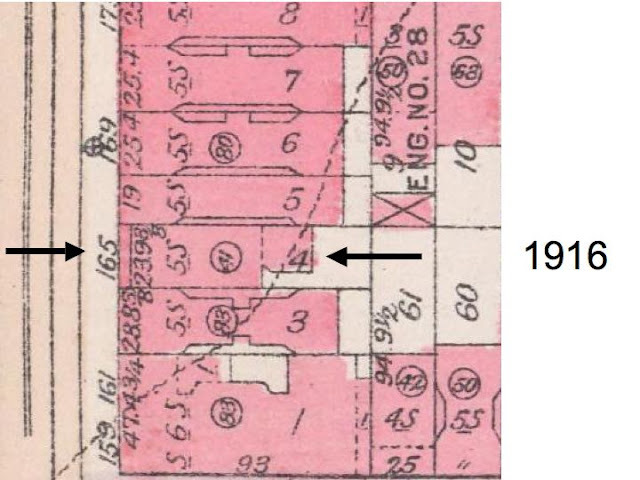 The city's documentation doesn't record construction dates prior to around 1910. If you look up the PLUTO (Primary Land Use Tax Lot Output) data or map, you'd think that the entire Lower East Side and East Village were all built in the year 1900. It doesn't take more than a moment's thought to figure out that they haven't transferred the construction data from the Municipal Records into digital form. 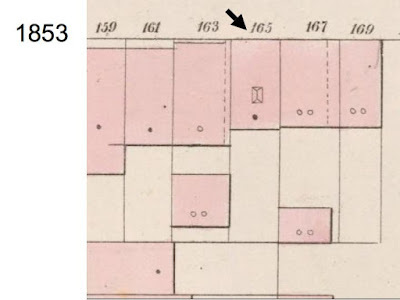 "1900" is a default indicating "sometime prior to 1900." Why PLUTO doesn't say that explicitly is a matter people should take up with them. A few years ago, they had the grace to add the letters "est" (estimated). But that's yet another misrepresentation (not to say "lie"). They've made no estimate of say, this building was built prior to 1830, compared with another built around the 1880's or 90's. This is a default value, not an estimate. Arrgh. One last anecdote. 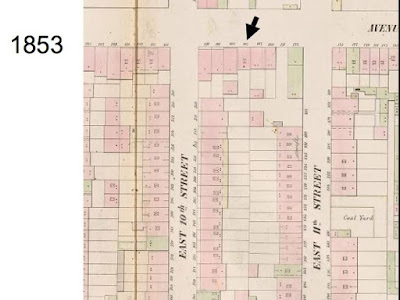 I once pointed out to the GVSHP director that 1st Avenue was older than most of the rest of the East Village -- most of the buildings were already standing during the Civil War. He responded that he thought I'd overestimated the age of the buildings. Now you know where he got his information. Not from looking at the buildings. 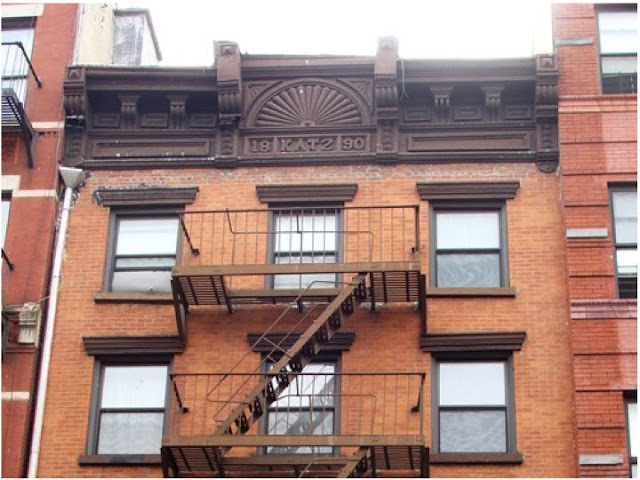 So: don't believe everything you read, whether it's a city document or a cornice. You need knowledge first before reading, since documents lie for all sorts of reasons. Who wrote the document and for what purpose? What were the tacit assumptions under which the document was made? What were the biases? Knowledge is an integral acquisition through experience of all aspects of human activity. Which leads us to the next piece. Next up, don't believe historians either. I checked to see if the "F" was still there. Unfortunately only the door frame remains. The old door seems to have been replaced. The entire rest of the ground floor is now one long display window. I remember back in 1978, the then owner would sit in front of the building selling newspapers every day.